This piece originally appeared in the December 1981 issue of Inside Sports. It also appeared in The Breaks Of The Game, and it reprinted here with permission. Sometimes when Kermit Washington talked about Swen Nater, his friend and teammate in San Diego, he would say that he understood Swen because he had been passed around a lot as a little boy. I can understand that, Kermit would say, I was passed around, too. That was a sad phrase from a difficult childhood in Washington, D.C. Passed around. His mother was a graduate of Howard University, where she had received good marks. She was very smart, he thought, but not so good at dealing with the pressures of life around her. She was always telling people to be truthful and honest and they were always letting her down. His parents split up when he was about three. There had been a terrible fight, one that he was not supposed to see. His mother’s brother had come over and there had been a family fight, and someone hit his uncle with an iron, and there had been blood. Everyone had been shouting and yelling. He had been absolutely terrified by the sight of the people he loved fighting with each other. That was the last time be saw his parents together. His father took custody of the children. Then his mother came by one day and took him and his older brother and ran off with them. It was an aimless, ill-planned flight and they were poor all the time. They stayed once with the Salvation Army and there were days with virtually nothing to eat. He had a memory he was not entirely sure it was true, of not eating for three days and then being given a ham and cheese sandwich and devouring it so quickly that he never even chewed it. Finally they had to wire for help and his father showed up to take them home. For a time, he and his brother lived with various members of the family—grandparents, aunts, uncles, father’s family, mother’s family, changing homes. There was a feeling, he remembered, of never really belonging, of perhaps not being wanted. He was convinced that the fault must somehow be his, and he became terribly shy, quiet to the point of being mute. He said as little as he could because he was afraid that anything he said might be wrong. Finally they ended up with his great-grandmother on his father’s side. She was a stern, strict old lady, but she also had time to love both boys. The rules were strict but he knew she cared. When he and his brother Eric brought their report cards home from school and their grades were predictably bad, they would tell the old lady that they had done well. She, after all, could not read or write. Pleased, she would mark her X on the card in the appropriate place. That was as good a time as he remembered. His father remarried and the boys moved back with him; his stepmother was clearly less than overjoyed to find that the Washington ménage contained two little boys. He had no memory, as a little boy, of anyone hugging him. The neighborhood that he grew up in was just shy of being a ghetto. Still, his area was not without danger; by all rights he should have been a street person, but he was afraid of the streets. There were always gangs and he was never a member of any gang. When the chance came to join a gang, he was too frightened to take it. It was, he decided later, a neighborhood of great hopelessness. 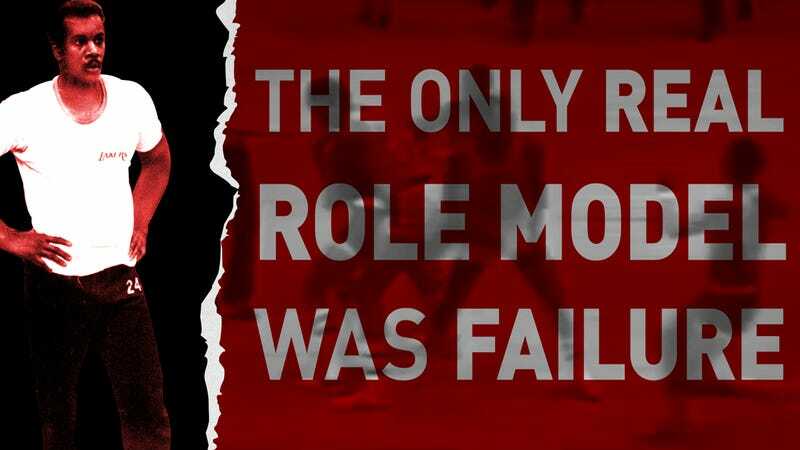 The only real role model was failure. Oh, perhaps there were a few black sports stars on television. But there was no connection, no sense that those people on television had anything to do with this sad, beaten neighborhood he lived in. He had as a boy loved to go to movies. Whenever he did and there was a black man in the movie, playing the role of a soldier, he was always sure that the black man was going to be among the first to die. He was rarely wrong. The schools were a reflection of the community. The teachers were, almost to a person, unable to help. They did not, Washington later decided, really believe that a black child could achieve anything. What had happened to them would happen to their students. Kermit Washington remembered himself in those days as a skinny awkward boy without friends, except for his brother and perhaps one or two other buddies. He considered himself a poor student, unsure of his ability at anything. He was relieved at the end of every class when the bell rang and he had gotten through without being called on. He was not a good athlete. He was so skinny that even in the summer he wore long sleeves and a long jacket so that no one would see how thin his arms were and make fun of him. In his senior year at Calvin Coolidge High he was about 6-foot-4 and perhaps 150 lbs. Other kids called him The Blade. He played some school football largely because he had a friend on the team and he did not like to walk home at night alone. He felt he could not do well at anything. He received uniformly poor grades in all classes. Then one day in biology class the students were dissecting frogs and the teacher, Mrs. Joan Thomas, watched him and said, “Kermit, you’re doing an excellent job.” He was terribly embarrassed and he was sure that she was making fun of him. All the other kids began to laugh, too, sure that she was mocking him. “No,” she corrected them, “I mean it. Kermit is doing an excellent job.” That was the first time anyone had ever told him that he was good at anything in his entire life. With that he began to feel confident in biology and he began to study and get good marks. Soon he had good marks in biology and poor marks in everything else. Then Mrs. Thomas became his homeroom teacher and she looked at his report card and told him that he ought to try to do better in other courses, too. “You know, Kermit,” she said, “you’re intelligent and you could get good marks if you wanted to.” He was stunned by that, by the idea that she thought he was intelligent. In his last year at Calvin Coolidge he made the honor roll. He was very proud of that. Yet it seemed unlikely that he would be able to go to college. Not many poor black graduates of Washington’s school system went to college unless they were either superb athletes or superb students. He was neither. In his senior year he had played on the basketball team but had not even started, and he had averaged perhaps four points a game. Then his stepmother made it very clear that when he graduated he was supposed to move out. Suddenly, he wanted to go to college. But he had no money. His brother Eric had won a football scholarship (he later played for the St. Louis Cardinals), so be decided he’d better win one, too. He was too skinny for football. But he was tall, so be decided that basketball would have to be his sport. Almost overnight, with the season virtually gone, he began to practice three hours a day. Then he heard of an All-Star game for Washington players. Those chosen would compete against another All-Star team from Pennsylvania. Everyone in playground basketball, which was big in Washington, knew about it, and only the best players were even invited to try out. Half terrified by the audacity of what he was doing, Kermit Washington, not even a starter at Coolidge, showed up for the tryouts. At first the officials were not even going to let him compete because he had not been invited. But he talked his way into the competition and as soon as he did he regretted it. He had made a fool of himself, he was sure, coming here to play against the best players in the city; they were all much better than he was. The gym was almost empty except for lots of quite snappily dressed white men, recruiters. Among them was a young man named Tom Young who had been an assistant at Maryland, where the teams were always big time, and who had just taken a job as head coach at American University, a weak school in basketball. The kids he could have recruited in the past for Maryland, the superstars, were now beyond his reach, and he would have to take what he could get. Young was, in his own words, working the scrap heap. But he noticed one young player, not very, good, almost bad, in fact, skinny and terribly unsure of himself, with no instinct for the game. But very quick, and tall and eager. So desperately eager that he dove for every loose ball. Young continued to watch him and he noticed another quality: The people who ran this tryout were treating the boy very badly and yet the boy never complained. So Young, who could not be choosy, and who saw something in the boy that he could not even describe, decided to offer him a scholarship to American. Forty kids try out, he thought, and I get the worst one. So Kermit Washington thought he was lucky in the fall and Tom Young thought he was lucky, because over the summer Kermit Washington grew four more inches. He arrived as a freshman, skinny as ever, still very quick, determined to build himself up. He lifted weights every day, right up until basketball practice; each night, before he went to bed, he put on a weight vest and ran up the seven flights of steps in his dorm several dozen times, building up his wind. No one, he decided, would be stronger or in better condition. Tom Young told him to lift weights only three days a week but he refused. “Coach, I’m not good enough to play unless I’m in better shape. Otherwise we can both forget it.” In his freshman year, playing against the varsity, the older, heavier players beat on him in what was almost a personal manner. Joe Boylan, the freshman coach, wanted to stop it, there was clear personal animosity there, but Young said no, Washington would have to learn to take it, things would get rougher in real games. At the beginning of his college years he was shy and retiring. College changed him. Later he decided his life could be divided into two parts—the part before college and the rest. He met his wife-to-be, Pat, when he was a freshman; she seemed smarter and more confident than any young woman he had ever known. She had watched him in a freshman basketball game and he had caught her attention by scoring four straight points for the wrong team, two when he had tipped the ball into the wrong basket and then, after the referee had lined them up the wrong way, two more. She thought he was very cute and tried to talk to him afterwards, but he was the shyest boy she had ever met. Finally she started going out with another member of the basketball team in order to be near him, but that didn’t work. Next she forced her roommate to go out with his roommate, and thus she could go to his room. But even then he wouldn’t talk to her, he simply sat there, reading a book. She realized that somewhere someone had beaten him down and had convinced him that he had nothing to say, nothing worth listening to. She wondered how the two of them could be so different; they were both black, her parents were hardly wealthy or even middle-class, her father had a simple job in the New York welfare department, but hers was a strong family with an absolute determination that she and her sister, who later went to Harvard Medical School, would go to college. She had been brought up absolutely sure of her place at school, her right to be there. He by contrast was terribly unsure, as if terrified that someday they would find out about him, a whistle would be blown and he would have to leave this haven and return whence he came. But there was something touching about him, his curiosity about everything, his desire to study. At night she would go with him to the playground and he would shoot and she would retrieve the ball until the lights were out and it was too dark and then they would go back to study. They would walk through the pleasant white middle-class section of Washington in which American University was located, and he would talk about how one day, if they worked hard, they might own a house like one of these. He began to be more confident. He did better in school. Pat helped him there; she was a good student. When he went home to his old neighborhood during the summer his friends teased him. “Kermit, what’s happened to you? You beginning to talk like a white person now, man.” He knew he was changing; he did not think it was a bad thing to change, to want to be better. He began to become a better basketball player, too. His body filled out and he continued to build himself up. So he gradually became more aggressive, and as Coleman had predicted, it became part of his game. He became, in a somewhat better-than-average college circuit, a great college player, intense, quick, an excellent rebounder. At the end of his junior year he was drafted by the New York Nets of the ABA. They offered him a five-year contract at roughly $100,000 a year to leave school and play for them. Half a million dollars! But American had saved him, and he owed it something. He turned the offer down. Later that day Tom Young, the coach, simply hugged him. Kermit Washington had never felt better about himself. By his senior year he was one of the best players in the country. He would read almost with disbelief stories in The Washington Post about coaches of opposing teams and how they were planning to stop Kermit Washington. Kermit Washington, that was him. For the last two years he led the nation in rebounding. In the last game of his senior year he was on the edge of becoming only the seventh player in the country to average 20 points and 20 rebounds for his entire college career. He had to make 39 points to do it and he had never been a great scorer. He was so nervous the night before that he could not sleep at all. On the day of the game he could not eat, and when the crowd, the largest in history at American, started cheering as he was introduced, he could barely walk. That night he scored 40 points. He was also an academic All-American. In his senior year he taught courses in the social sciences. It was a life which just a few years earlier he could never have envisioned. A few weeks later he was made the first-round draft choice of the Los Angeles Lakers, chosen No. 5 in the whole country. The year before that, in Wilt Chamberlain’s last season, Los Angeles had come close to winning the championship, and the Lakers were now sure that they had a strong team, particularly in the front court. There was no place for Washington to break in. In college he had played center, and he had been big enough and strong enough and above all quick enough to play against other centers. Bigger men were almost always slower. But he had been drafted to play forward, and he was, in addition, unprepared for the difficult transition from college star to pro. College star after college star had been destroyed by failure to make the adjustment. Most had, after all, almost always been the strongest players on the court, first in high school, then in college, and had never bothered to develop more subtle skills, because those skills had not been needed. Few coaches, moreover, had much interest in broadening a player’s game. Strength was enough. Then, overnight, the player arrived in the professional game where everyone else was strong and everyone was big and everyone was quick. He might well have had a no-cut contract, but he almost certainly found himself playing out of position. College centers play with their backs to the basket and their offensive moves are simple, one quick fake and a spin; professional forwards face the basket from a greater distance and they have to move without the ball and to put the ball on the floor in order to play their position correctly. Similarly, those deft and graceful in college, successful because they were so good at the ballet of basketball, now needed to add power and strength to their game. What made it even more difficult was the fact that there is virtually no individual coaching and teaching in the NBA. There is an assumption that a player arrives in the league in full possession of all the basic skills. Either that or he sinks. For a long time, Kermit Washington sank. He had been told in advance that he would play very little in his rookie year, but like all rookies he had not believed this. He had played in only half the games, averaging only 10 minutes a game at that. What was worse, in the second year things did not improve very much. He was playing some backup center and some power forward, and it was clear that if he had any future in the league it was at power forward. But he was awkward there. He had no sense of the game. Now, for the first time in three years, he became frightened of failing. Bill Sharman was the coach and Washington went up to Sharman and asked him to teach him the game. But Sharman, harassed by pressures beyond his control, worried about his own position in the organization, had little time for instruction. The third season was even more disappointing. He knew now that the Laker front office thought he was a write off, a failure; worse, they had concluded that there was nothing wrong with his body, and therefore he was dumb. He had, by painfully hard work, become someone in his life and now they were taking it away again. There had been one game against Golden State when he bounced off Rick Barry, fouling Barry clumsily, and Barry—who had little tolerance for fools—had turned to him angrily and said, “Listen, you better learn how to play this game.” That had stung. He stayed up late that night seeing the play, hearing Barry’s words, seeing not the anger on his face but the contempt, all of it made much worse because he knew that Barry was absolutely right: He had better learn to play the game. By the end of that third year he was desperate. It was not the money that was at stake, his contract was good; it was his sense of self, so laboriously put together and, he realized, so precarious. He waited until the season ended and then, in desperation, he went to Pete Newell, a former college and professional coach, then with the Lakers in a peripheral capacity, and asked if Newell would teach him to play forward. He was terrified about asking, he barely knew Newell, but he had always heard what a great coach he was. He was afraid that Newell would mistake his request, think that he was trying to gain points in the organization or get a better contract, or simply that he was too pushy. But the alternative was too grim. Newell in turn was astonished. In recent experience, no player in the league seemed willing to admit that he still had something to learn. “Why do you want to take lessons?” he had asked. “Because I want to play like Paul Silas,” Washington had answered, which was good enough; Paul Silas was an example of the best of the NBA players, a triumph of character and intelligence over the lack of pure athletic skill. So Newell was intrigued by the request, and he said, yes, they would meet, at 7:00 a.m. He was sure the hour would put Washington off. It did not. The first few weeks were terrible. Pete Newell was, in most human situations, an absolute gentleman, intelligent, soft-spoken, his clothes and manner more that of an Ivy League professor than of a basketball coach; but in the privacy of the gym, he was radically different, tough, demanding, the coach as drill sergeant. He was even tougher than usual with Kermit Washington; if he was going to take on a charity project he wanted to be absolutely sure that the project was worth accepting. Each day when Washington came home he was unable to walk for two or three hours. At the end of those two weeks, Pete Newell decided that Washington had a chance to be an even better player than Paul Silas. He was a slightly better jumper, and he was quicker. So they began special tutorials for a professional player making $100,000 a year. These were the kinds of drills Newell usually gave to 17-year-old college freshmen, on footwork, on balance, on moving the feet, keeping the hands in the air. They were an odd couple, the old gray-haired man pushing the young black player. Newell told Washington to study the book on Silas, take film clips of his games home and memorize them. All that summer they worked long sessions together two and three times a week, and in the end Pete Newell thought he had a player. He began to tell Washington to take jump shots, not because he was a particularly good shooter, but because he needed to be able to score and, even more important, he had to believe that he could. Forwards have to have small jump shots. Not great ones. But acceptable ones. In the beginning Kermit Washington was terrible. Gradually he became a competent shot. He still hated to shoot from more than six feet away, as if he regarded shooting as uncharitable. The lessons changed him. For the first time he understood his position and what was expected of him. At the start of the 1976 season he was a different player. By now Kareem had become the Los Angeles center and Washington was the ideal forward to play alongside him; Kareem was a great shooter and a good rebounder, but not that physical; Washington was not a good shooter, but he was a fine rebounder, and he was a physical player. For the first time in his professional career he was playing with confidence, averaging nearly 10 rebounds a game. That was the year in which Portland went on to win the championship, but during the regular season Los Angeles played Portland three times, with Kermit Washington in the lineup, and won three times. Suddenly basketball was fun again. Then in the 54th game of the season Kermit Washington’s leg went out. There had, of course, been plenty of warning—athletes’ bodies usually give repeated signals—but in professional sports there is a tendency to ignore the warnings. Washington had been feeling pain in his knee for weeks; he would put heating pads on his knees before a game, and ice on them after, and he took a lot of bute, the anti-inflammatory drug that dealt with the pain but not with the problem. He knew he was taking a risk in using the bute, that he was in effect killing not the cause but simply the body’s warning to him. He now had trouble walking after games and could not drive his car for more than five minutes at a time without getting out, in terrible pain, and stretching his legs. If he was walking down a decline, he had to angle his leg because he could not bend it properly. Moreover, the pain was not just in his knee, but went through his entire body and into his head, and he was gobbling aspirin before every game because the headaches were so bad. He knew that because of the pain he was changing as a person, becoming more irritable and edgy, less secure. He also knew what was wrong with him. He had tendinitis, jumper’s knee. This was particularly unsettling, since his game was premised on one thing, his jumping ability. Pat Washington was appalled by what was happening to him. “I can’t understand why you’re doing this, you’re taking too much risk,” she would say. But she had become, she knew, the outsider. He was the basketball player, he knew what was at stake. He refused to take himself out of a game, or to miss a game. One night the Lakers were playing Denver and he drove the baseline past Paul Silas. Silas never touched him, but then Kermit Washington heard a terrible pop and he instantly knew what had happened. He went down as If shot. He had known pain all his life but he had never felt pain like this. He was absolutely out of control rolling up and down the floor like a little kid. He finally looked down where his kneecap was supposed to be. It was no longer there. It had slipped over to one side, and where it was supposed to be there was simply a big dent. He had severed a patella tendon. It was as if someone had snipped the string that held his knee in alignment. The season was over for him and, it turned out, for the Lakers as well. They iced his knee and operated on him at six o’clock the next morning. He was terrified that his career might be over; not many athletes make it back from so serious an injury. During the surgery and then in the days and weeks after it, the pain was beyond anything he could remember. When Pat Washington had brought his daughter Dana to visit him, she had frolicked on the bed. Afterwards he had been forced to tell Pat that much as he loved his daughter, Dana should not come next time, the pain was too great. The doctors told him he probably would not be able to play basketball again. He fell into a deep depression; when the Lakers made the playoffs he could not bring himself to attend the games. This time it was Pete Newell who pushed Washington, insisting that he not quit, that he try to play again. The leg was almost atrophied from the injury. Washington was not even sure he could bend it and run, but Newell was so single-minded that he dared not slack off. It was as if Newell were offering him a personal challenge. Every day he forced Washington to do more drills, to accept more stress on the leg. Each day he was sure he had to quit; he would come home and tell Pat that he did not think he could go back the next day, and the following day he returned. The worst thing about Newell was that he was acting as if Washington had never even hurt his leg. One day Newell introduced him to a sliding drill. Washington tried it and the pain took him right back to the moment of the original injury. “No way I’m going to do that,” he told Pete Newell, “no way I’m going to do it, even for 45 seconds.” “You’re going to do it, and you’re going to do it for 20 minutes, or your career is over,” Newell said. So he stayed with it and gradually his leg came back and he was able to play again. He played surprisingly well. He was, the doctors decided, a quick healer. Then on Dec. 10, 1977, in the 24th game of the season, playing against Houston, he went up for a rebound against Kevin Kunnert, a very tough, physical player, threw two quick elbows. That surprised Washington, who thought they were friends, and he retaliated with a swing, and then Kareem grabbed Kunnert and Washington hit Kunnert and he went down. Then out of the corner of his eye, Kermit Washington saw a figure in a Rocket uniform rushing towards him and he swung as hard as he could. The uniform belonged to Rudy Tomjanovich. Kermit Washington hit Rudy Tomjanovich as hard as he could right on the face, a punch doubled in impact by the fact that Tomjanovich was running towards Washington at the time. It was a terrifying moment. The impact of fist upon face sounded, Kareem Abdul-Jabbar said later, like a watermelon being dropped on concrete. Washington, 230 lbs., all muscle from many long hours in gyms, had smashed Tomjanovich’s entire face, and come within millimeters of killing him. It was, the chief surgeon in charge of putting him together remarked, like piecing together a shattered eggshell with Scotch tape. “I have seen many people with far less serious injuries not make it,” the doctor said. Washington ran through all of that moment over and over again, both in his mind and later in court. He had held Kunnert and tried to push off, coming off the boards. That was a foul, something you did every game, and tried to get away with. Kunnert had pushed back, a quick elbow and a punch—something confirmed by the film, by other Laker players, and even by Tomjanovich’s teammate Robert Reid. Then he had swung and everything had gotten out of control. He remembered Tomjanovich simply as a blur in a uniform. It was a terrible thing, but it was not deliberate, it was a part of the frenzy of the game. The commissioner, Larry O’Brien, had already been worried about the growing number of fights and the potential for serious injury. He immediately suspended Washington and fined him $10,000. This meant a loss of about $60,000. He bore the burden of what he had done to Tomjanovich, and even worse, what he had almost done. He tried briefly to get in touch with the man he had maimed, with no success. Tomjanovich was in the hospital, first fighting for his life and then gradually undergoing a prolonged, difficult, delicate series of operations to rebuild his face. He wanted no part of Kermit Washington, his sympathy or his friendship. Washington found that he had been judged and convicted, not just by the commissioner and by the media, but by the fans as well. All the years of effort he had devoted to gaining approval had been stripped away. The management of his team made no move to defend him, nor did anyone from the Lakers get in touch with him. Meanwhile the mail was the ugliest he had ever seen, hundreds of letters, all filled with racial epithets. He was shattered by the fact that people who did not know him could hate him so much. Pat was in the last month of pregnancy with their second child. They felt completely alone. There was a question of whether Kermit would ever be able to play again. Larry Fleisher, the head of the Players’ Association, called him to suggest that the association be allowed to protest O’Brien’s decisions, the fine and the suspension. It was a clear violation of due process. It would never stand up in the courts, Fleisher said. But Washington wanted none of it, and Fleisher realized finally that Washington had been through too much already and he simply could not bear an additional replay in court. In the years that followed, Washington nevertheless became the center of a complicated legal action in which Tomjanovich sued the Lakers (and won some $3 million in a Houston court); and he came to hate the law and all its works, even when they were directed against the Lakers; he hated what was implied, that he was some kind of animal, a monster the Lakers had failed to control properly. He never said so—he had become too wary and he knew his position was too vulnerable—but he believed that the entire legal action was in part racially motivated, that if it had been a white player hitting a white, or a black player hitting a black, there would have been less media fuss, a less energetic intervention by the commissioner, and less passion in the courtroom. He felt a public enemy, a marked man. It was clear to him that the Lakers were finished with him. There had been one fight earlier in the year between Kareem and Kent Benson, a white center for Milwaukee. The Lakers had stood by Kareem but Washington was sure they were not about to do the same for a second black player involved in a fight with a white. As he waited, the only person he had any contact with was Pete Newell. One day Washington showed up at Newell’s door with a huge color television set. With it was a small plaque that said, FOR COACH NEWELL. THANK YOU FOR MAKING ME A BETTER BASKETBALL PLAYER. KERMIT WASHINGTON. A few weeks after that the Lakers traded him to Boston. Red Auerbach had always coveted him. Washington loved playing in Boston. He felt at home there. He had never seen an athlete like Dave Cowens before. In turn, Cowens loved playing alongside Washington. “It’s great fun,” Cowens said, “you can always hear him grunt when he’s rebounding.” At the end of the season Boston owner Irv Levin switched teams with Buffalo owner John Brown, and Washington came to San Diego when Levin moved the team. Even now, rehabilitated, accepted by teammates and fans in two different cities, he was aware that he had been part of something terrible and frightening, that he was on the edge of having committed, however involuntarily, a dark deed. He was also, in a more pragmatic way, aware that he was a target now, not just for fans, but for other physical players. Unlike anyone else in the league, he dared not get in a fight, so there were sharp limits to how much contact he initiated. He had a dream, more than once: He was at a restaurant and went to the men’s room. There a man pulled a gun on him and, terrified, he hit the man. Then Kermit ran from the men’s room to the parking lot, where he was picked up by two cops, one white, one black. They accused him of killing a man. The black cop hackled him and the white cop put a black hood over his head, and they took him to a courtroom. There a judge looked down and announced that he was guilty of murder. Washington understood that nightmare perfectly.